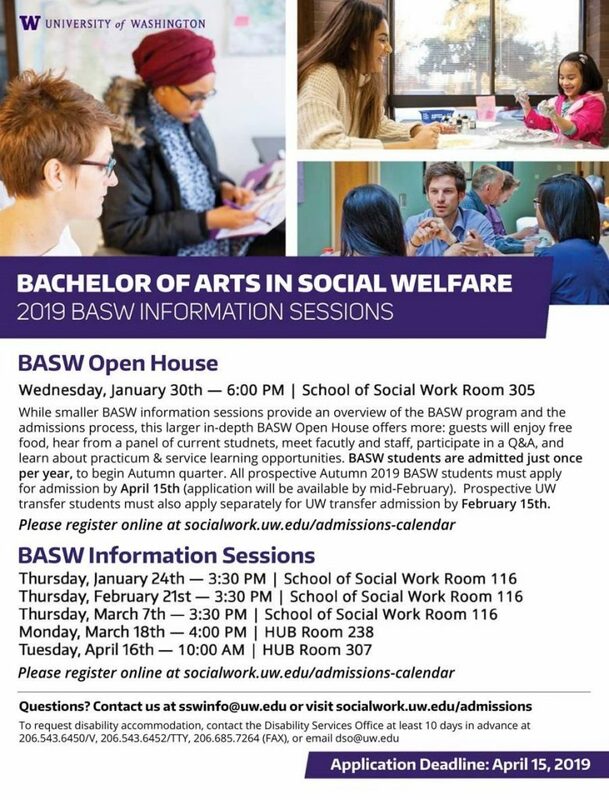 Prospective students are invited to next week’s Bachelor of Arts in Social Welfare (BASW) Open House on Wednesday, January 30th at 6:00 p.m. in Room 305 (third floor) of the UW School of Social Work building in Seattle. See this page for details and to register! Guests will enjoy free food, hear from panels of current students and faculty, and get BASW application tips plus advice about our accelerated 10-month Advanced Standing Master of Social Work degree. Social workers serve in mental health clinics, nonprofits, hospitals, schools, community agencies, etc. to help people and enhance the quality of life for all – especially those most vulnerable and oppressed. They value a person-in-environment, systems approach and employ a uniquely holistic, strengths-based social work lens rooted in social justice activism. Social work is social change! Students are admitted to the Social Welfare major just once per year, to begin in September. Autumn 2019 BASW admission applications will be available in February (approx. Feb 11th), with an April 15th deadline; see this page for prerequisites and info. Prospective transfer applicants must also apply separately for UW transfer admission (Autumn 2019 UW transfer application deadline is February 15th) and should review the UW undergraduate Admissions website for details.